A Military Approach to Alignment: One Team, One Fight. I am a recently retired Marine Corps Intelligence Officer who is leveraging military best practices to add value through Sales Enablement. As I’ve worked to develop and run data-driven sales campaigns, I’ve experienced difficulties stemming from a lack of alignment between Sales and Marketing. This lack of team work is something I’m not accustomed to, but something that could be overcome by adopting a military mindset. To coordinate military operations, Marines use the concept of "main effort" and "supporting effort." The main effort is the commander's primary bid for success and tasked with accomplishing the mission (normally the infantry). The supporting effort is responsible for ensuring the success of the main effort (normally includes logistics, intelligence, supporting fires, admin, etc.). During execution, the focus remains steadfast on mission accomplishment. If the main effort fails, we all fail. Therefore, when faced with a decision the supporting effort simply asks: How can I best support the main effort to enable them to accomplish the mission? Let’s apply this concept to Sales Enablement. I consider the sales force to be the main effort and Sales Enablement to be the supporting effort. Sales is the CEO’s primary bid for success to hit his/her revenue targets. Sales Enablement is responsible for accomplishing the mission by ensuring sales professionals, the main effort, are highly trained, armed with competitive offerings, and focused on highly qualified leads to lead to a high likelihood of success. If they don’t hit their numbers, everyone fails. 1. Focus sales related activities - My career in military intelligence taught me that timely, accurate, and relevant data is critical to successful execution. It drives planning and operations; especially offensive operations. Let me give you an analogy: you’re tasked to destroy an enemy position. Without good intelligence regarding the enemy’s location, you would be forced to conduct “movement to contact” patrols (i.e., search the area until you happen upon them). But if you’re provided timely, relevant, and accurate intelligence, you can plan a deliberate, targeting raid at the decisive time and place where you have the advantage and maximize your chance of success. Sales can be thought of in the same way, especially with new client pursuits. Without timely, accurate, and relevant data on sales leads, your sales teams are forced to conduct generic prospecting activities (e.g., cold calling). However with timely, accurate, and relevant market intelligence, they could plan a deliberate, focused sales engagement with relevant messaging targeting qualified leads. 2. Reinforcing sales related activities - Like supporting arms (artillery or air strikes), marketing can prep the objective to increase the chances of a successful engagement. Sales campaign specific digital marketing messaging targeted at the campaign prospect list can raise buyer awareness and provide a warm call opportunity where the sales reps are following up and reinforcing the initial messaging. In some cases, these marketing efforts can produce inbound leads that help support prospecting activities. Adapting a one team, one fight mentality can be an excellent way to achieve Sales and Marketing Alignment focused on achieving overall revenue goals. It’s just one of many military best practices I’ve adopted to create sales enablement programs that drive revenue growth through data-drive insights, business innovation, and collaboration. You don’t need to have served to adopt these practices at your own organizations. 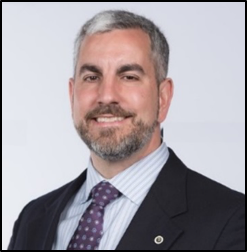 Ted Corbeill is a recently retired Marine Major who is leveraging his military experience to build and lead innovative sales enablement programs to drive revenue growth through data-driven insights, business innovation, and collaboration at DXC Technology. Before being recruited by DXC Technology (then Hewlett Packard Enterprise), he was a Business Development Executive for a systems integration firm specializing in industrial automation. He is also a Founding Member of the Sales Enablement Society, Dallas Chapter. Ted received his MBA in Management Information Systems from Iowa State University and his BS in Commerce from the University of Virginia. The Moment I Knew Sales+Marketing = Genius! One of the things that I thought a lot about last year was when did I take a stand to say that “Sales and Marketing not only should work together better but they must for the survival of the business.” After much thought, the catalyst event came to mind. This event was so pivotal for me because I not only experienced a change in myself but I witnessed a change in my colleagues as well. So what happened? I can do things you cannot, you can do things I cannot; together we can do great things. Many years ago I was attending a typical sales meeting. These meetings usually were put together to talk about the state of the business, allow people on the team to network, share best practices, etc. Sometimes these meetings were fruitful and allowed for colleagues to think about the business in a different way; many times even energizing folks to get out there and sell better. More often than not, however, they were too frequent and a superfluous repetition of the same stuff we talked about in the last meetings. This meeting, however, was differet - little did I know. Our manager had invited someone from the Marketing team to come talk about a new initiative that they were launching aimed at helping Sales become more efficient in selling to customers. While the strategy was not groundbreaking for most marketers it was a concept that wasn’t really common in Sales. What this marketer did so eloquently was explain why the Marketing team thought using this framework was important for the company, how it would help Sales sell more efficiently, and how it could be implemented by each individual in the room as soon as the next day. And that is when it hit me. This wasn’t just some new strategy mandated from the Ivory Tower of Marketing because they didn’t have anything else better to do, No, this was a tool that could actually help me do my job better. Now it made sense. And not only did it make sense for me but I could see it also made sense for my colleagues. There was an excitement after the presentation that was not typical for a sales meeting. My colleagues were asking questions and trying to figure out with which customers they were going to target first with this new tool. And the questions weren’t those “I just need to seem engaged so my boss thinks I care and that I’m a leader” questions. These were genuine questions to gain a better understanding. 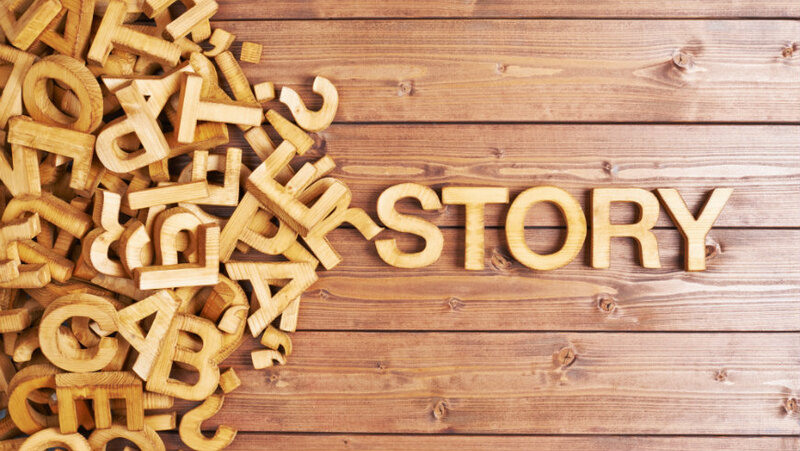 From this point on, I recognized the power of open dialogue between Sales and Marketing. What an opportunity to take advantage of! Each group has skills that are uniquely theirs and they should be celebrated, however when each group is able to understand more precisely how their actions impact the other group it creates a powerful synergy that leads to success. Beginning the journey to Sales and Marketing alignment doesn’t have to be a huge undertaking. It can begin with something as simple as a conversation to share ideas. Many larger organizations by now know or should know they need to be more agile/entrepreneurial in order to survive. However, this can be extremely challenging in a larger organization for several reasons. One that seems more challenging than it has to be is establishing a structured feedback loop between Sales and Marketing. The reason this feedback loop is critical is that it allows the organization to iterate faster because Marketing gets real-time feedback from the best market research provider – Sales (which is also free). As mentioned in The Lean Startup by Eric Ries, it’s about getting “…through the Build-Measure-Learn feedback loop with the minimum amount of effort”. This data is valuable and necessary. Who best to tell you what the customer really thinks about your product and what should be modified? Enterprise software like Salesforce has functionality that allows for this to happen. A company can start with something as innocuous as a general email address that Marketing can scan to get a pulse of what is happening in the market. It allows the customer to know that you are listening to them and willing to respond with product/service modifications. It also demonstrates to Sales that the organization recognizes them as a partner in the business decision-making process. When Sales feels appreciated it is a tremendous motivator for them to be more invested in the entire selling process. 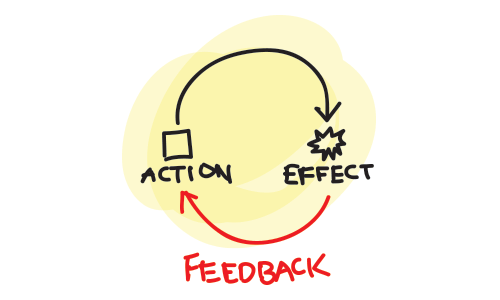 So…….no matter what method, having a structured feedback loop is important. Just creating a “process” is only one part of the story. In addition, the organization must create a level of trust within Sales to feel comfortable sharing both positive and negative feedback. Without a culture that rewards transparency you might as well not have a feedback mechanism because you will only get glowing reviews and other nonsense so people get recognized for sharing the best reviews from customers. This type of relationship is completely counterproductive and will be a waste of everyone’s time. If you want real feedback, reward real feedback. It will be invaluable to the success of the organization. It’s like the old saying…Garbage In Garbage Out (GIGO). During my time in college, I had the honor of working at the NASA Johnson Space Center in Houston, Texas. As a mechanical engineering student, it was my dream job. I would get the chance to work in the space industry, something my 7th-grade science teacher had inspired me to do. It was an opportunity to go to adult space camp. And boy was it fun! Where else do you get a chance to meet career astronauts, train on the shuttle simulator, and sit in mission control where the famous words "Houston....we have a problem" were spoken? And even though I gained a wealth of amazing and memorable experiences, the one that stands out the most was learning how to influence without authority. Of course, back then I didn't know what it was called—but now I understand clearly what lesson I gained from my internship experience. As I approached the middle of my project, I realized that I needed to have parts made in the machine shop. I was quickly warned that it would take forever to manufacture the parts and that I ought to take that into account for planning purposes. When I asked why that was, I was told that the machine shop workers belonged to a union and simply took their time. I was not satisfied with that answer. What I learned from that tour was invaluable. One welder told me "You must be a new engineer. The others never come over here." And it was then that I not only gained respect from the crew in the machine shop, but also understood that in order to get things done, I needed to make my projects personal—not just a job number from some random engineer. Marketers operate in a world that requires building consensus and getting people to do things without being their boss. It's a delicate balance of driving strategy and preserving relationships. It also requires the ability to communicate clearly and articulate your vision so that others can understand what you and the team are trying to accomplish. For many sales leaders Sales and Marketing Alignment might look like a tall order that may have marginal impact on the business. We, however, have an overwhelming amount of data that suggest that alignment is one of the effective strategies in impacting revenue growth. 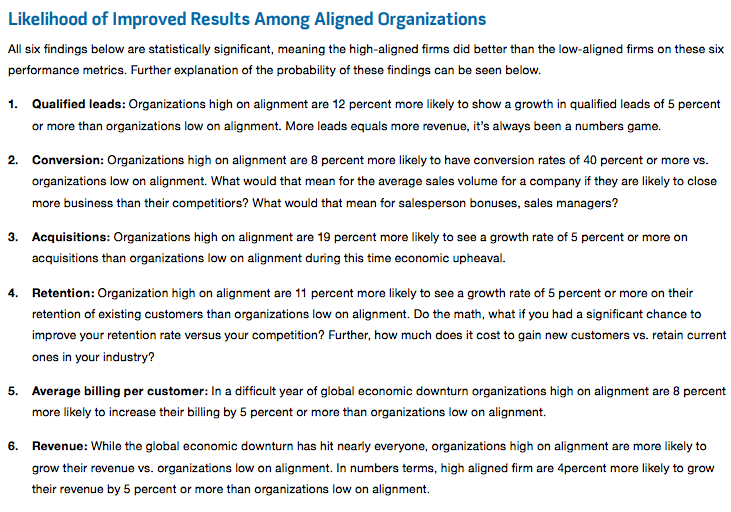 Even with a forward-thinking sales executive, the question still remains - what should I be asking from my marketing colleagues as we move toward alignment. In any organization if you want salespeople to make a significant change in their behavior you are going to have to sell them on how it is going to help them sell more effectively. Thus, the sales leader must be able to clearly articulate exactly how completing alignment activities will help them achieve quota. Increase the productivity of customer/opportunity acquisition. Target the right accounts and help sales pursue them. Bring customers together to explore topics and educate them. This list can be a starting point for a sales leader as he/she evaluates the proposal of aligning with marketing. Even with an overwhelming amount of evidence of the benefits of better alignment, leaders must still keep in mind that part of their job will be changing the hearts and minds of many who have a done it a certain way for a long time. If we focus on the opportunity of alignment we can more easily get our colleagues on board and motivate them to want to collaborate with each other. There has been talk lately of the traditional sales funnel being outdated as it does not truly capture the way in which B2B customers interact with sellers today. It has been estimated that buyers are 57% through the buying process before they reach out to vendors and that during that buying process the average size of the purchasing group is now 5.4 people [CEB]. With these two changes in the market it can be understood that the buyer's journey is no longer linear. In fact, more and more business are moving to a subscription business model where renewals and upsells hold significant importance. How does this change the way we look at customers? We can no longer just focus on closing a deal as the future value of the customer is too important. We have to reframe how we engage with prospects and look at establishing a relationship that will lead to future growth opportunities. This new model is referred to as a continuous engagement model. It focuses on 4 stages - Find, Engage, Close and Grow. The benefit of this model is it more accurately captures the behaviors of prospect as they seek information from a myriad of sources to help them make informed decisions. Also, depending on the timing of their buying cycle they may engage with us via a webinar, email, event or demo then go silent and re-engage with us at future date. The current sales funnel might not accurately capture that interaction and consider it a closed-lost deal. However, if a sales team is aligned with their marketing colleagues we can discuss how to stay engaged with the prospect account that keeps our solution top of mind and continues to give them a compelling reason to interact with us. While I do agree the continuous engagement model more accurately depicts how prospects interact with sellers in today's market, I think it can be challenging to quantify the conversion rates for each stage thus making it more difficult for the sales organization to forecast what they need to do in order to achieve revenue targets. In contrast, this model does help each group, if they are aligned, better understand the "pull through" opportunity when the prospect engages with the company. Is the current sales funnel out of date?I don't think completely. However, what we do know is that more companies are acting like subscription businesses and so we have to adopt models that help us better understand our business and what is really happening with our prospect interactions. I think before moving to the continuous engagement model fully, an organization will have to commit to better aligning sales and marketing so that they can use the model to inform what decisions should be made at each stage of engagement and what action or content should be used to support that event in the best way. In today’s business environment it is becoming more and more important to have strong alignment between Sales and Marketing. The Aberdeen Group’s research shows that companies that optimize the marketing/sales relationship grow revenue 32% faster. This is clear evidence that the dysfunctional and sometimes toxic relationship between these two functions can no longer exist if the organization is to succeed against the competition. Some may ask then why don’t we just appoint an executive, like a Chief Revenue Officer, and make them work together? My simple answer is….management is not the only problem. There needs to be a fundamental shift in the way these two functions see each other and a clearer understand of their interdependence. I call it creating “Togetherness”. It’s that sense of understanding that we are all in this together and if we don’t work together well we won’t be able to generate revenue and then we all loose. It’s when Marketing thinks about the impact that their work has on generating revenue and ask how will Sales be able to execute this strategy. It’s when Sales interacts with customers, learns new insights and proactively thinks that I need to share this information with Marketing to add to the collective knowledge of the company. It’s when both Sales and Marketing understand that everything they do should be focused on generating revenue for the company. This is “Togetherness”. Companies that optimize the marketing/sales relationship grow revenue 32% faster. Having a career in both Sales and Marketing, I have seen first-hand the missed opportunities for each group to work together better. The majority of the times I have witnessed an alarming misunderstanding of the value their peers of the other function bring to the table. It’s estimated that Sales reps ignore 50% of marketing leads [Source: The B2B Lead]. Anytime you have either Sales or Marketing dismissing the work of the other, you have an enormous problem in your organization. The perfect strategy without execution is worthless. I cannot think of two business functions that need each other more than Sales and Marketing. So I propose doing more to help Sales and Marketing understand the value of their colleagues. What can Sales teach Marketing? One of the many missed opportunities that I have noticed is involving Sales early in the planning process for the brand/product strategy. Marketing usually knows the macro-level market better than Sales. However, when it comes to understanding the potential roadblocks to execution and the subtleties of tactical delivery, Sales almost always understands this better. Many times there are shifts in the environment that Marketing is not aware yet. By having Sales on board working in tandem, Marketing can avoid major avoidable missteps that can help them be more competitive. There is a wealth of knowledge that both Sales and Marketing can share with each other. If the organization is truly committed to making this relationship work they must invest the time to share best practices between these two teams so they can learn to appreciate one another. When it comes to Sales and Marketing Alignment, achieving “Togetherness” is the ultimate goal. I was extremely excited to have the opportunity to have a conversation with Will Barron over at The Salesman Podcast about Sales and Marketing Alignment. I had the chance to share my thoughts on how salespeople can leverage their marketing colleagues to close more business. What exactly Marketing can do for salespeople, the information Sales can ask for and how Marketing can directly support Sales in prospecting. Hope you enjoy and share the episode!